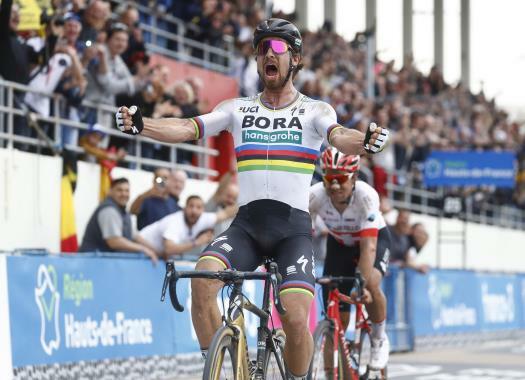 Peter Sagan took his first win at the 2018 Tour de France and will wear the Yellow Jersey after beating Sonny Colbrelli and Arnaud Demare at the end of stage 2. The Bora-hansgrohe rider had to settle for second behind Fernando Gaviria on the opening day of racing but took full advantage of the Colombian's absence due to a crash in the stage 2 finale. "I'm really happy about today and I have to give a big thanks to all my teammates as they were in the front for the last 30 kilometers," the World Champion said. "I expected something easier but it was really tough. Up and down, a right turn, a small descent and then climbing again. "The start (of the sprint) was better today. Demare started with Degenkolb and then I just overtook them. I was really lucky that Colbrelli didn't jump me." The Slovak will wear the Yellow Jersey in Monday's Team Time Trial, and was pleased to move into first place in the presence of many of his friends and family. "I'm very happy. I have a lot of friends here, especially on this stage. My father is here, my friends from Zilina, my home city. It is nice to thank them and also dedicate this victory to my son Marlon."